You can easily resize pictures, text boxes, shapes, and WordArt in your Office file. You can also remove unwanted portions of a picture by cropping it. If you want to stretch, shrink, or just change the size of a picture (or shape), use the sizing handles or for more precise control, the Size options on the Picture Tools Format tab or the Drawing Tools Format tab. Click the dropdown control below for more details. Click the picture, shape, WordArt, or other object (such as a chart) that you want to resize. To keep the center in the same place, press and hold Ctrl while you drag the sizing handle. To maintain the proportions, press and hold Shift while you drag the sizing handle. To both maintain the proportions and keep the center in the same place, press and hold both Ctrl and Shift while you drag the sizing handle. Note: Resizing a WordArt object in this way only resizes the box the WordArt is in. The actual WordArt text behaves just like any other text in Word. If you want to resize it simply select the text you want to resize and change the font size on the Home tab of the ribbon. Click to select the picture, shape, WordArt, or other object that you want to precisely resize. To resize multiple objects at the same time, press and hold Ctrl while selecting each object. To resize a picture, on the Picture Tools Format tab, in the Size group, enter the new measurements into the Height and Width boxes. To resize a shape or other object, on the Drawing Tools Format tab, in the Size group, enter the measurements you want into the Height and Width boxes. Note: If your screen size is smaller, you might need to click the down arrow in the Size group to see the Height and Width boxes. Click the dialog box launcher in the bottom right corner of the Size group. In the format pane or dialog box that appears, clear the Lock aspect ratio check box. Click the picture, shape, WordArt, or other object that you want to resize. To resize a picture, on the Picture Tools Format tab, in the Size group, click the dialog box launcher . To resize a shape or other object, on the Drawing Tools Format tab, in the Size group, click the dialog box launcher . If your screen size is smaller, you might need to click the down arrow in the Size group to see the dialog box launcher. To maintain the original proportion, select the Lock aspect ration check box and enter a Scale percentage for Height or Width. 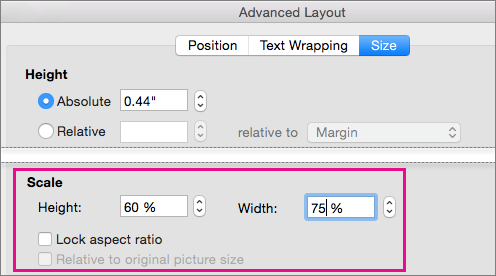 To resize to a different proportion, clear the Lock aspect ratio check box and enter Scale percentages for Height and Width. Resizing stretches or shrinks the dimensions of an object. Click the picture, shape, text box, or WordArt that you want to resize. To keep the center of an object in the same place, press and hold CTRL while you drag the sizing handle. To maintain the object's proportions, press and hold SHIFT while you drag the sizing handle. To both maintain the object's proportions and keep its center in the same place, press and hold both CTRL and SHIFT while you drag the sizing handle. To resize a picture, under Picture Tools, on the Format tab, in the Size group, enter the measurements that you want into the Height and Width boxes. Note: If you do not see the Picture Tools and Format tabs, make sure that you selected a picture. You might have to double-click the picture to open the Format tab. To resize a shape, text box, or WordArt, under Drawing Tools, on the Format tab, in the Size group, enter the measurements that you want into the Height and Width boxes. Note: If you do not see the Drawing Tools and Format tabs, make sure that you selected a picture, shape, text box, or WordArt. You might have to double-click the picture to open the Format tab. In the Size group, click the Size and Position dialog box launcher . On the Size tab, under Size and rotate, clear the Lock aspect ratio check box. To resize a picture, under Picture Tools, on the Format tab, in the Size group, click the Size and Position dialog box launcher . To resize a shape, text box, or WordArt, under Drawing Tools, on the Format tab, in the Size group, click the Size and Position dialog box launcher . Note: If you do not see the Drawing Tools and Format tabs, make sure that you selected a picture, shape, text box, or WordArt. On the Size tab, under Scale, enter the percentages of the current height and width that you want to resize to, in the Height and Width boxes. Clear the Lock aspect ratio check box. Tip: To apply the same height and width to different objects, select all objects that you want to have the same dimensions, and then in Size group, enter the dimensions that you want in the Height and Width boxes. To select multiple objects, click the first object, and the press and hold CTRL while you click the other objects. Warning: You cannot return a picture to its original size if you previously cropped and saved it, or if you selected the following options from the Compression Settings dialog box (to open the Compression Settings dialog box, under Picture Tools, on the Format tab, in the Adjust group, click Compress Pictures, and then click Options): the Delete cropped areas of pictures check box, and either Print (220 ppi): excellent quality on most printers and screens or Screen (150 ppi): good for Web pages and projectors. Select the picture that you want to return to its original size. Under Picture Tools, on the Format tab, in the Size group, click the Size and Position dialog box launcher . In the Format Picture dialog box, click the Size tab, under Original size, clear the Lock aspect ratio check box, and then click Reset. When you modify an image with the Graphics Interchange Format (.gif), Joint Photographic Experts Group File Interchange Format (.jpg), or Portable Network Graphics (PNG) file format, you can save the original version of the edited picture. Right-click the edited picture, and then click Save as Picture on the shortcut menu. In the Save As Picture dialog box, click the arrow next to Save, and then click Save Original Picture. Note: If you have trouble selecting the object because it is behind another object or objects, click the top object, and then press TAB until your object is selected. Note: If you do not see the Picture Tools and Format tabs, make sure that you selected a picture, shape, text box, or WordArt. To resize a shape, text box, or WordArt; under Drawing Tools, on the Format tab, in the Size group, enter the measurements that you want into the Height and Width boxes. In the Size group, click the Dialog Box Launcher . On the Size tab, under Scale, clear the Lock aspect ratio check box. To resize a picture, under Picture Tools, on the Format tab, in the Size group, click the Dialog Box Launcher . To resize a shape, text box, or WordArt, under Drawing Tools, on the Format tab, in the Size group, click the Dialog Box Launcher . To apply the same height and width to different objects, select all objects that you want to have the same dimensions, and then in Size group, enter the dimensions that you want in the Height and Width boxes. To select multiple objects, click the first object, and the press and hold CTRL while you click the other objects. Note: You cannot return a picture to its original size if you previously cropped and saved it, or if you selected the following options from the Compression Settings dialog box (to open the Compression Settings dialog box, under Picture Tools, on the Format tab, in the Adjust group, click Compress Pictures, and then click Options): the Delete cropped areas of pictures check box, and either Print (220 ppi): excellent quality on most printers and screens or Screen (150 ppi): good for Web pages and projectors. Under Picture Tools, on the Format tab, in the Size group, click the Dialog Box Launcher . Note: If you do not see the Picture Tools and Format tabs, make sure that you selected a picture. Click the Size tab, clear the Lock aspect ratio check box, and then click Reset. If you want to stretch, shrink, or just change the size of a picture (or shape), use the sizing handles. For more precise control, if you have a desktop version of Word, Excel, or PowerPoint, you can use the Size options on the Format tab. Click the picture, shape, or WordArt you want to resize. To keep the object's center in the same place, press and hold the OPTION key while you drag the sizing handle. To maintain an object's proportions while resizing it, press and hold the SHIFT key while you drag a corner sizing handle. Click the picture, shape, or WordArt you want to precisely resize. Click the Picture Format or Shape Format tab, and then make sure the Lock aspect ratio check box is cleared. To resize a picture, on the Picture Format tab, enter the measurements you want in the Height and Width boxes. To resize a shape or WordArt, on the Shape Format tab, enter the measurements you want in the Height and Width boxes. To resize a picture, click the Picture Format tab, click Position > More Layout Options. To resize a shape or WordArt, on the Shape Format tab, click Position > More Layout Options. Click the Size tab, and under Scale, make sure the Lock aspect ratio check box is clear. Enter percentages you want for Height and Width. Tip: To apply the same height and width to different objects, select all objects you want to have the same dimensions, and then enter the dimensions in the Height and Width boxes. To select multiple objects, click the first object, and then press and hold SHIFT while you click the other objects. If you want to stretch, shrink, or just change the size of a picture (or shape), use the sizing handles. For more precise control, if you have a desktop version of Word, Excel, or PowerPoint, you can use the Size options on the Picture Tools Format tab or the Drawing Tools Format tab. For this procedure, you must have a desktop version of Word, Excel, or PowerPoint. 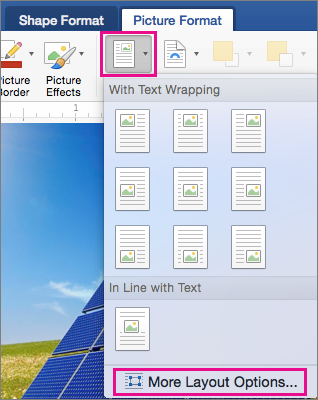 Click Edit in <Word, PowerPoint, or Excel>. Click the picture, shape, WordArt, or other object that you want to precisely resize.